My wife and I go to Island Bar & Grill at least once a week and love the Wings. I grew up in New York and think Island Bar & Grill can give the original Buffalo Wings a run for the money. 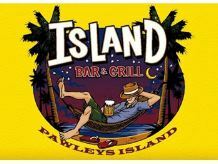 Island Bar & Grill has great happy hour specials, awesome sports specials during football season and a friendy staff that makes it a pleasure to go eat wings and play NTN Trivia. We always make it a point to bring family members there when they are in town visiting. The speed of service is lacking and the staff is somewhat indifferent. They don't seem to care. I ordered a simple appetizer and it took forever and a day. Great food, drinks, prices, and the staff is very friendly! Great neighborhood bar, feels like you're at home. Many TV's to watch and sports all the time. Pool tables, darts, silver strike bowling, jukebox, Wii, and much more to entertain you. 2 floors and a huge deck with live bands. A must to check out! We go there very alot. We like the service we receive there. The bar tenders are very good especially Chris. He is so friendly and nice every time he is there. We really enjoy the Island Bar every time we go. They are very friendly, the food is very good, and they have a nice deck out back with its own bar that is great when the weather is nice.